A few weeks ago, I impulse-bought a couple tubs of Thai curry paste. Since then, it’s been curry central in this household. I love how these pastes provide deep flavor and powerful heat, without any work involved: no chopping, no mashing, no nothing. If you have Thai curry paste in the fridge, coconut milk and rice in the pantry, maybe some fish sauce and limes, you can follow the recipe on the label and turn pretty much any combination of protein and veggies into a quick and powerful meal. But even beyond that, I’ve found these pastes are terrific for everything from dumplings to lentil soup to a simple coconut sauce for fish or chicken (which I’ll get around to posting sometime soon). I bought two kinds of curry paste: red and green. The red curry is a bit sharper and tangier, while the green curry is rich and deep and slightly sweet. I actually like the green better for straight-up curry, but the red has proven to be a bit more versatile overall. 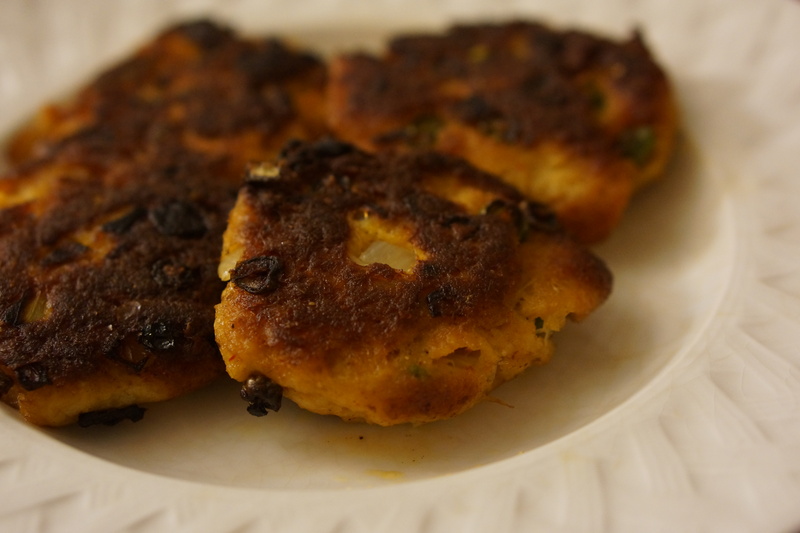 When I learned that red curry paste is a key ingredient in Thai fish cakes, it was only a matter of time before I tried it in one of my favorite seafood dishes of all time: crab cakes. This is a total mash-up recipe, in the best way. These little nibbles have all the flavors of Thai fish cakes–red curry, green beans, scallions, fish sauce, lime–with the texture of an all-American crab cake. Unlike the Thai version, which requires a food processor and deep-frying, these can be made in a matter of minutes in just one bowl, with minimal mess and less fuss. The crab mixture benefits from a little time in the fridge before cooking, but it’s really not necessary. I can–and have–made these on a whim for Sunday lunch, in 20 minutes or less. They’re terrific that way. How big or small you make these is totally up to you. I go for a sort of middle ground and make 8 smallish cakes, which I think are ideal for an at-home appetizer or light lunch. You could make 4 giant cakes, or 16 itty-bitty cakes to serve as a party snack. If you go bigger, I’d suggest covering the skillet while the cakes cook, so that they heat through by the time they’ve browned. It’s a good thing my pie crust mojo came back when it did. It is fruit season, and I am psyched. The produce section at my local supermarket smells like peaches. Sam and I have been eating cherries like candy. The strawberries actually taste like strawberries now. It’s fun enough to just eat all this fruit out of hand, but when we want to actually do something with it, there’s nothing quite like a pie. 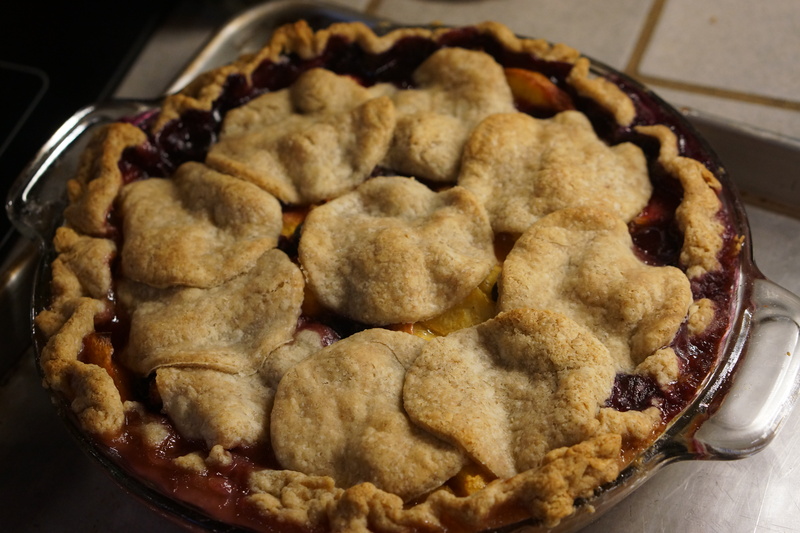 Sam’s mom was the one who first introduced me to nectarine-blueberry pie. She’s an avid pie baker all year round–pecan and custard pies when it’s cool out, and fruit pies when it’s warm. Nectarine-blueberry is her signature fruit pie, and I fell in love with it almost immediately. The two fruits work so harmoniously together: the nectarine is heady and sweet, the blueberries lush and jammy. The texture is gorgeous, with chunks of stone fruit and wilted nubbins of berry. Recently I decided to try my own spin on the recipe. I adore spices and fruit together, so I spiked the filling with a bit of ginger and cardamom for warmth. Other than that, this is a fairly classic recipe, a bit elaborate to put together but lovely and homey when it’s baked. Like other stone fruit pies, it’s pretty juicy; I’ve found that the filling starts bubbling over well before the pie itself is done baking. After one particularly nasty mess on the floor of a friend’s oven, I’ve learned to bake this pie on a foil-lined baking sheet. It’ll still make a glorious mess, but at least it’ll be easier to clean up. In testing this recipe, I’ve learned a couple nifty pie tricks. First, for a better crust, add an egg in two stages: the white gets brushed on the bottom crust to prevent sogginess, and the yolk gets brushed on the top crust to help it go golden. Second, a drinking glass makes a great lazy person’s pie crust cutter. Placing rounds of pastry on top of the pie is just as pretty and functional as weaving a lattice, with about half the effort. I’ll be making a lot of pies this way this summer.